hey guys! hope everything is going well! i wanted to pop in today with a quick recipe since, when i post pictures of my food, especially my mashed cauliflower, on my IG page (thesweatybetty) i get tons of questions of how i make it and what i top it with. i may start doing this more often, since i can answer a lot of questions all at once, and its easier than being confined to an iphone screen! so! if you have any other recipes you would like me to share, let me know, and i’d be more than happy share! steam the whole head of cauliflower however you choose to steam it. i have a pampered chef microwave steamer that works great for this purpose. 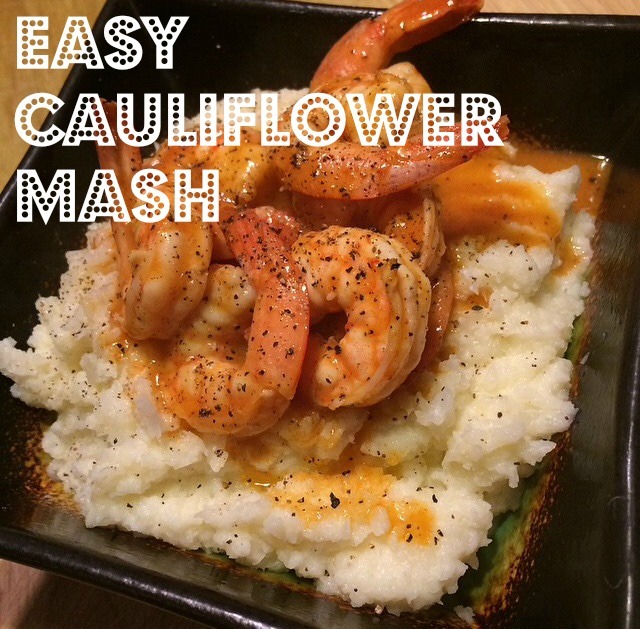 when cauliflower is done steaming and fork tender, add to the blender and blend away! this is where i’ve realized a little liquid goes a long way. many times, i’ve ended up with cauliflower soup, because i added too much liquid. i recommend starting with a little bit, and working your way up, versus too much in the beginning! the length of my blending depends, somewhat, on what i’m making with my cauliflower. if i’m making my imitation ‘shrimp & grits’ i leave it a little less blended with less or no liquid, for a texture that closely resembles grits. when i make it as a side to lamb chops (pictured below) or steak, i blend a little longer for a creamy texture that closely resembles creamy/mashed potatoes. the toppings are also endless! i LOVE mine with blue cheese, or maybe i just love blue cheese? who cares. i love them with blue cheese. you could also sprinkle some cheddar cheese if you’re not a blue cheese fan. you could add a little extra butter if you want to. bacon goes well with just about anything, so why not add it to this mash? or add butter, sour cream, cheese, AND bacon for a load mashed potato which has a little less guilt, since you’re not eating the potatoes, or if you are following a ketogenic diet like me! my main suggestion is to just play with it! like i’ve said, i played with my measurements until i found a mixture that i loved. it took quit a few cauliflower soups before i found out the ratios that i liked. start out less (milk/butter) and add more if you think it needs it, if it still seams chunky and dry, add a little more at a time, and blend longer than you think it needs! if you have any of questions, let me know! hopefully this helps some people!